If there’s an important game coming up on TV, you do your best not to miss it. A weekend getaway with old friends? You’re in. But what about the time it takes to see a primary care doctor? Do you make time for your health? Do you have a primary care provider? Men, for a variety of reasons, are less likely than women to go to the doctor for a yearly checkup. Roughly 40 percent of men skip this important health appointment, according to a Cleveland Clinic survey. What they may not realize, however, is that they’re missing out on much more than routine bloodwork. They’re passing up a relationship that could improve, even save, their lives. 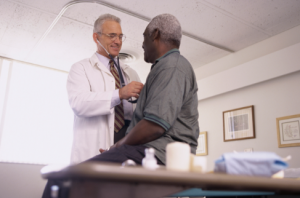 A primary care physician is more than someone who looks at blood pressure and cholesterol levels. Primary care providers act more like coaches – they can tell you what you need to work on to improve your health and the strategies it will take to achieve your goals. One of the perks to modern health care is the ability to catch significant illnesses early when they’re easier to treat. Of course, that can’t happen if you don’t take advantage of health screenings. The best person to help you stay up to date with recommended screenings is your primary care doctor. Using their knowledge of your health and the current recommended guidelines, your provider can tell you if you’re overdue for blood work or if it’s time to schedule a colonoscopy. Remember, many health problems won’t create symptoms. High blood pressure, a serious medical condition, doesn’t cause any symptoms at all. The only way to detect it is to have your blood pressure measured. Is that freckle on your shoulder just a sun spot or something more to worry about? What about the pain you’ve recently noticed in your neck? Is it arthritis or just a pulled muscle? Should you keep lifting weights? These are the types of questions your primary care can answer, giving you peace of mind. When you need urgent care, your primary care doctor can share important medical information with the emergency care doctors treating you. Your primary care doctor can tell them your family medical history, whether you take any medications, have drug allergies or have any relevant underlying medical conditions. Guiding you through the insurance maze. One of the greatest benefits to having a primary care physician is knowing they can help you navigate insurance requirements. Should you have a health problem, your primary care provider can help ensure you get whatever tests you really need. At Bon Secours, our primary care providers are part of a larger medical group of physicians, specialists, and facilities. With dozens of practices throughout the region, we offer many convenient locations to our patients. For more information or to find a healthcare provider near you, call 804-359-WELL or visit http://goodhelpdocs.com/.